Last Sunday this place hosted about 25 people for a company event and it was great. It was my first time putting an event together and the MGR Lee and another nice guy named Billy could not have made the process easier- or affordable! They reserved pool tables, ping pong tables, the shuffleboard and provided good food with great service. The atmosphere was laid back and welcoming… even the bathrooms were clean. My entire Team had a great time! It’s been well over a year since I’ve even looked at YELP (sorry YELP) but the service at this place motivated me to let others know about Buffalo Billiards. Great place to have some fun & relax and have a drink- I’ll be going back – with my company and without! Great girls night option. Everyone was nice. The music was fun. They have darts, shuffleboard, foosball, and pool. Definitely going back. There are plenty of pool tables and they even have darts, ping pong, foosball, shuffle board, and a few arcade games. Pool, Darts, Table Tennis, Arcade games a Juke Box to play great music! Food was bomb would come back. Bonnie was the greatest! the crowd isn't too rough and the girls behind the bar are really awesome (and attractive!). One of the best places to go with friends or date night in Sonoma County. I have been going to Buffalo Billiards since March 2017, and after six months of visiting at least once per week, I am giving Buffalo Billiards five stars. 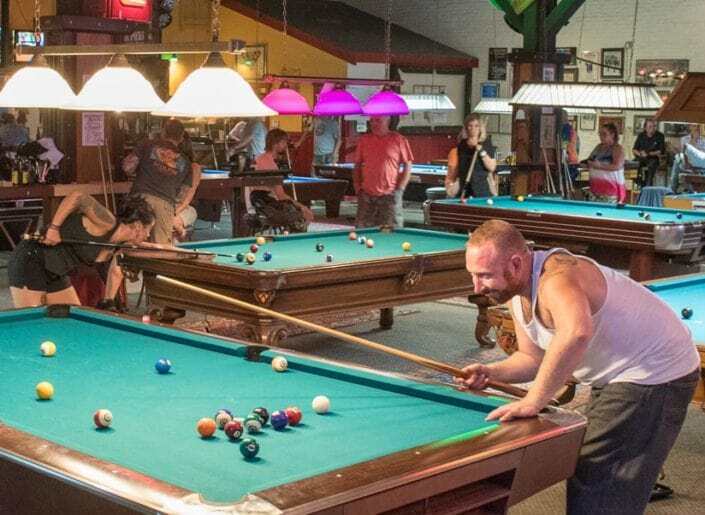 It was my new years' resolution to learn how to play pool and at Buffalo Billiards and after a few times of coming to this pool hall, I've decided that it is my favorite place to play pool in Sonoma County. The owner, Lee, is very nice and he makes sure that all of his tables are kept in good condition, there are enough pool cues for everyone (which are replaced often when there are wear and tear), and I have a reliably good experience each week that I come. I tend to go on Sundays with my boyfriend since it is $1 per hour per person but I try to go on other days of the week too. I loved all of the staff when I first started coming, but since it is a bar/pool hall with a young staff, I understand that staff turnover is higher than other businesses. The new staff was a bit slow at first, but they've caught on well in the past few weeks and waiting an extra 60 seconds hasn't taken away from the excellent experience I have at this facility. My boyfriend recently purchased a pool cue from here and he LOVES it and the staff (not the bar staff, but the store staff that knows about pool/equipment) were very helpful and let him try out several cues over the course of the weekend until he found the one he wanted. Excellent service if you're looking to buy a cue! If you happen to not be a serious pool player, this facility also has darts, shuffleboard, ping pong, etc. and lots of different beer and cider on tap. It's a fun place to bring your friends and I'm always introducing all of my friends to this place. Buffalo Billiards serves food such as individual pizzas (you create-your-own), sandwiches, hot dogs, mozzarella sticks, onion rings, etc. When I'm in the mood for a treat, I love to eat here. This place is a must see when in Petaluma! Buffalo Billiards is a great place to hang out, shoot some pool, and have a beer. They even have really good food! The French fries are delicious. This is the best pool hall in California! This place is a go to if you're looking for a genuinely good time. The atmosphere is amazing. It is a safe and friendly environment. The staff here is very welcoming and polite, and truly want you to have a great time. For the price you pay, you get a lot of fun here. I highly recommend stopping by for a game of pool! I've been going to buffalo billiards for a while now and it's always been a great time. The beer is always cold and the food is always hot. Some of the nicest employees you'll meet and they always remember your name. I suggest you grab a friend and get yourself a pitcher and a table.